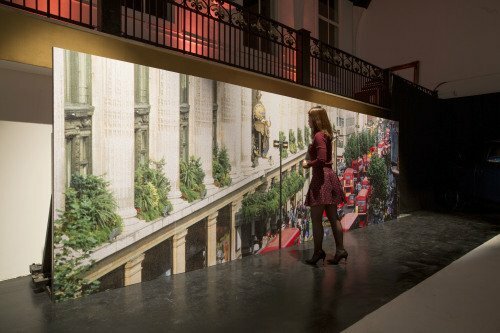 Hyundai Motor UK 'drives London' to create world-first 500,000 photo mosaic and believe me the results are spectacular. Hyundai Motor UK unveils the results of a 50 day driving challenge in London called A Streetcar Named Hyundai. The highly complex feat has involved driving, photographing and filming every central London street, 2092 miles, as defined by the world-famous cabbie 'Knowledge'. Created to mark the 10 year anniversary of Hyundai Motor UK, the drive was completed in the Hyundai ix35 Fuel Cell - a car that emits nothing but water and is the world's first commercially-available hydrogen fuel cell car. The Hyundai ix35 Fuel Cell was fitted with special equipment and bespoke software designed to capture over half a million photos throughout the drive. All the 503,919 images taken en route have been used to create a stunning 6m x 2m mosaic, a digital continuous image of all London's streets - delivered through a bespoke software engine that sequences, aligns and blends the images in real time - as well as a 200.5 second time lapse video (marking the UK company's 2005 heritage) -available to view at www.astreetcarnamedhyundai.com. The final mosaic image depicts Oxford Street, voted as the most iconic street in London*, and will go on display at City Hall in March 2016, as part of London's Hydrogen Week. Deputy Mayor for Environment and Energy Matthew Pencharz said: "Energy-efficient transport like these hydrogen fuel cell cars are key to helping improve the capital's air quality and reduce carbon emissions. The Mayor has transformed London's buses into the greenest fleet in the world and it is great to see the automobile sector also stepping up to do their part. I'm pleased that Hyundai's project has produced such an interesting portrait of our city with their new hydrogen technology and I look forward to hosting a part of the finished product here at City Hall." The drive was mapped by the Ordnance Survey team who delivered the Olympic torch route, the first time the famous Cabbie 'Knowledge' has ever been routed as one continuous drive to cover every street. 127 drivers participated in the challenge including British Olympic Boxing Champion Nicola Adams, reality TV star Jamie Laing from Made In Chelsea and WRC driver and co-driver Thierry Neuville and Nicolas Gilsoul. Hyundai created entirely new software to capture the drive which controlled the camera shutter, based on the car's speed, distance traveled and angle of travel to frame the entire journey photographically. The camera took pictures every 6-7 metres delivering 503,919 images - that's 207,000 MB of data. Tony Whitehorn, Hyundai Motor UK's President and CEO comments: "We're incredibly proud of how far Hyundai has come in the UK in the short space of 10 years. During this time our brand has been completely transformed through innovation, design and technology - all of which encapsulate the Streetcar Named Hyundai challenge. This unique activity has all been about showcasing London from a different perspective - just as we want people to view Hyundai from a different perspective. Aside from what's been achieved, what's been even more special about this challenge is that it has been brought to life by our own employees who have all driven parts of the route over the 50-day period. We are delighted with the results." Nigel Clifford, Chief Executive of Ordnance Survey said: "From the outset of the challenge it was clear that detailed digital mapping and accurate routing would play a vital role. At OS we map Great Britain to amazing detail making over 10,000 changes a day to the mapping database. This up to date, detailed mapping allowed us to confidently plan and plot a continuous route weaving through the capitals road networks. This is, in fact, the most challenging routing project that we have ever undertaken and are delighted to have supported Hyundai." London taxi driver and knowledge teacher of 30 years, Tony Norris says: "The Cabbie Knowledge is world renowned, unique to London and takes an average of 3-4 years to complete. But, this is the first time that the entire six mile radius has been routed in this way as one continuous drive. I'm not surprised it took 50 days, with the London traffic and unpredictability of London streets, it's a really impressive achievement."